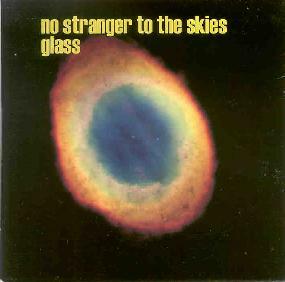 Glass - "No Stranger To The Skies"
Back in the mid to late 70's, American progressive rock band Glass made a number of recordings. But in an era that had become dominated by disco and slick and breezy pop tunes, they had difficulty finding a record label, and the recordings remained un-released, languishing on the shelf for 20 years after the break up of the band. But now, Glass are back together, and have compiled their recordings into a lavish 2-disc set, the first disc consisting of studio recordings, the second of live recordings. Glass plays spacey, instrumental, keyboard heavy progressive rock. Their music will have fans of the mellotron drooling, as the vintage instrument is featured on almost every track. Glass take their cue from British progressive rock, but unlike most of their contemporaries who treated synthesizers as little more than fancy organs, this trio embraces the new technologies of their time, letting them expand their sound in directions that few others were doing at the time. Disc 1 opens up in fine form with No Sranger to the Skies, a title that suggests an outer space opus, and with its layers of synthesizers, mellotron, processed mellotron, and scintillating percussion, it delivers. Give the Man a Hand is a bit more of a rocker that brings the bass into the forefront, but also features some futuristic sequences floating in and out of the mix. Domino relaxes the pace again, and features a lovely pastoral section with acoustic guitar and mellotron before finishing with a bright and jazzy finale. The Myopic Stream delves into some highly expressive piano playing in both rock and classical styles. The disc 1 closer, For Ursula Major and Sirius the Dog Star showcases the band having fun trading licks on all manner of keyboard instruments from clavinets and synthesizers to acoustic and electric pianos, and it even has a tasty middle section with groovy sequences and Moog drums. Considering it is a live recording from the 70's, the sound quality of disc 2 is surprisingly sharp. The centerpiece of this disc is the nearly half-hour long epic, Broken Oars. It eases you in slowly, seducing you with its distant crashing waves and moody mellotron. From there, it twists and turns through vigorous rock workouts, gentle acoustic breaks with an English folk feel to them, strange experimental sections, jazzy soloing, mountains of symphonic keyboards, moody ambient stretches, and numerous time signature changes. But despite its length and variety of sound, Broken Oars holds together extremely well. It's nothing less than a prog rock lover's wonderland. The rest of disc 2 also has some fine things to offer, from the smoking piano playing on Changer, to the dreamy acoustic and symphonic textures of Home, to the dark and moody album closer, Patrice Mercault's Dream. The CD has extensive liner notes, featuring complete equipment lists and specs for every track, as well as thoughts and recollections by the various band members on each song. If you have any inclinations towards this kind of music, you owe it to yourself to check out this undiscovered gem. You won't be disappointed. For more information you can visit the Relentless Pursuit web site at: http://www.rpursuit.com/glass/Index.asp. Contact via snail mail c/o Relentless Pursuit Records; PO Box 1649; Ojai, CA 93024-1649.